Mine: Great version of my favorite play. Wonderful and very dramatic. 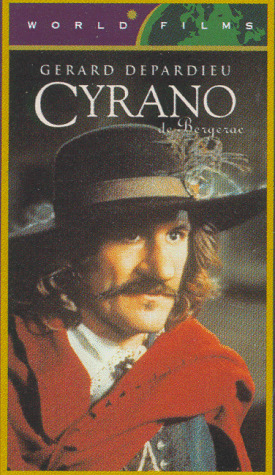 Depardieu is terrific. Leonard Maltin/Plot synopsis: Likely to remain the definitive screen version of the Edmond Rostand perennial (depending on your personal passion for Steve Martin's ROXANNE). Quite visceral, and frequently inspired (vide the decision to stage the balcony scene during a mild rainstorm), faltering only a little during the finale, which is overextended. Jean-Claude Carri�re and director Rappeneau scripted; English subtitles by Anthony Burgess.